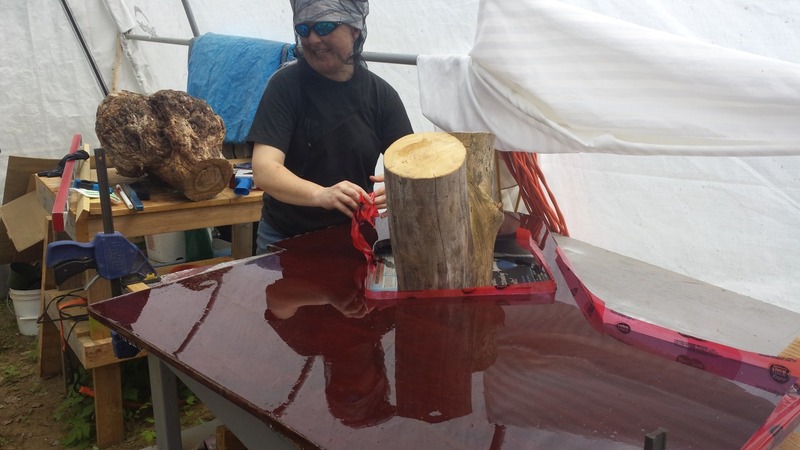 Previously, here on Sailing the Earth, I was telling you about our adventures with epoxy. It is fascinating stuff, if a bit temperamental. Well, things have progressed and I can now share with you how it all turned out. 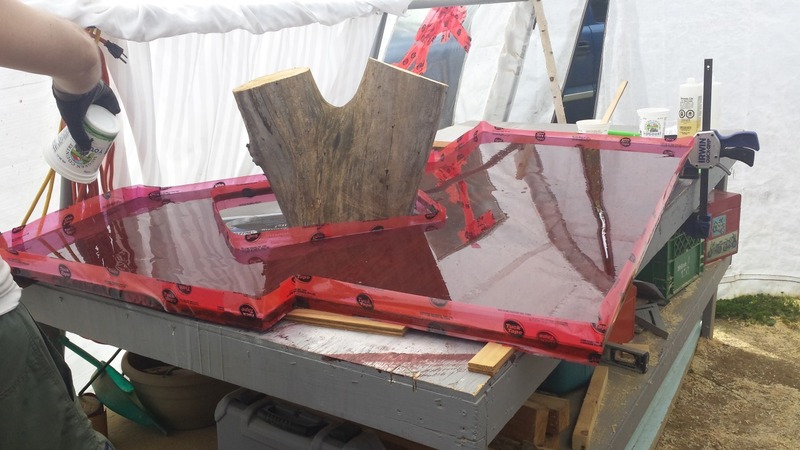 After completing the third and final coat of epoxy, the counter was ready to be installed. It wasn’t super perfect, but it was quite a bit improved from the first coat. There are still two bugs embedded in it that I couldn’t dig out, so they will have to stay in there… forever. Maybe someone will clone bugs from their DNA in a 1000 years. I let the third coat cure for several days and then while Kat was at work on Sunday (yesterday, July 23rd) I proceeded to install it. First I had to prep the surface. This meant clearing off all of the clutter that was on the base, cleaning it and then applying a generous amount of glue. Looks a lot like a breakfast pastry, doesn’t it? 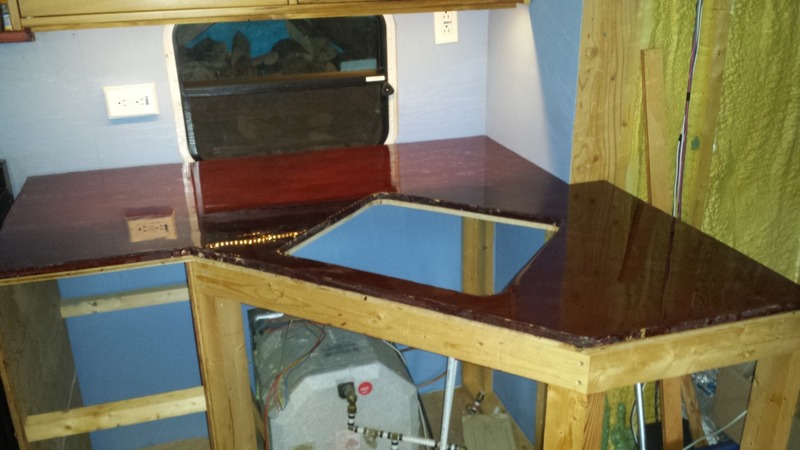 With the base all prepped, all there was to do was put the newly finished counter into place. I clamped it and screwed it down from underneath. That counter is not going anywhere. 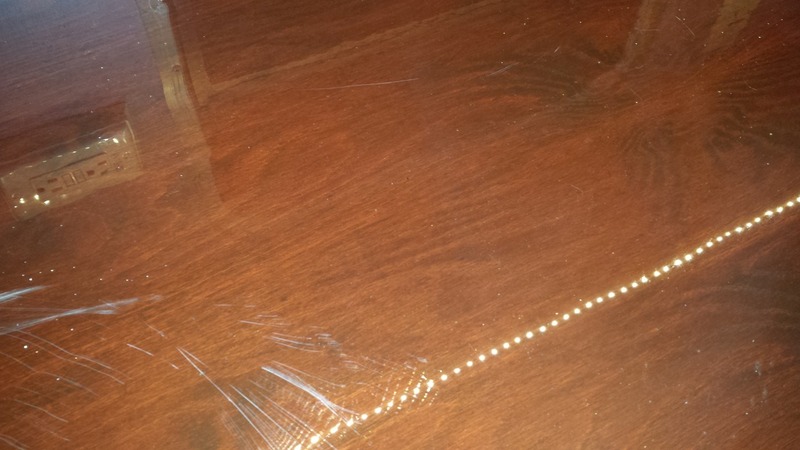 Sorry for that blurry picture, but you can probably see just how shiny the counter is. Here is a close up. Unfortunately, I discovered the hard way that it scratches pretty easily, or at least the brand that we used for this project. You can see the scratches I put in it in the bottom-left corner of the above picture. I didn’t have a way to clamp the counter down at the back so I used a 20L (5 gallon) jug of water to weigh it down. In positioning it on the counter, I twisted it a bit and the bottom of the jug is knurled plastic, so it left those marks you see above. Fortunately, this is the trailer and not the house, so learning these things ahead of time is a useful experience. 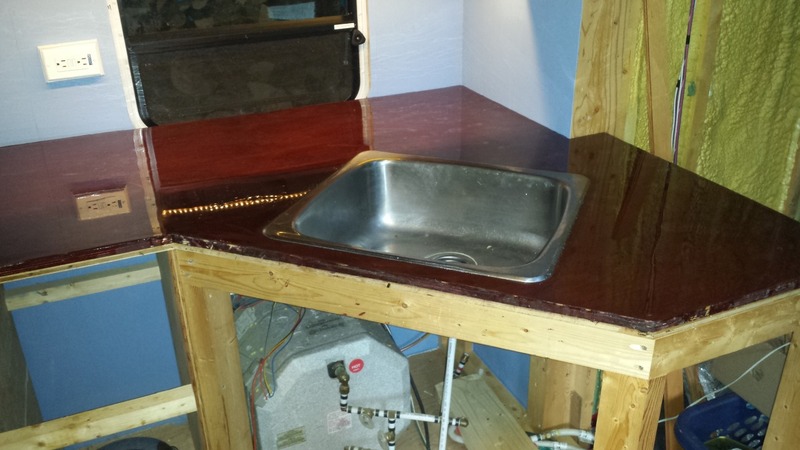 With the counter locked down, it was time to install the sink. Unfortunately, I miscalculated just how many pieces I would need to finish the plumbing of the sink drain and I wasn’t able to get it completed in one day. Kat was in town this morning so she stopped at the hardware store and picked up the missing pieces. 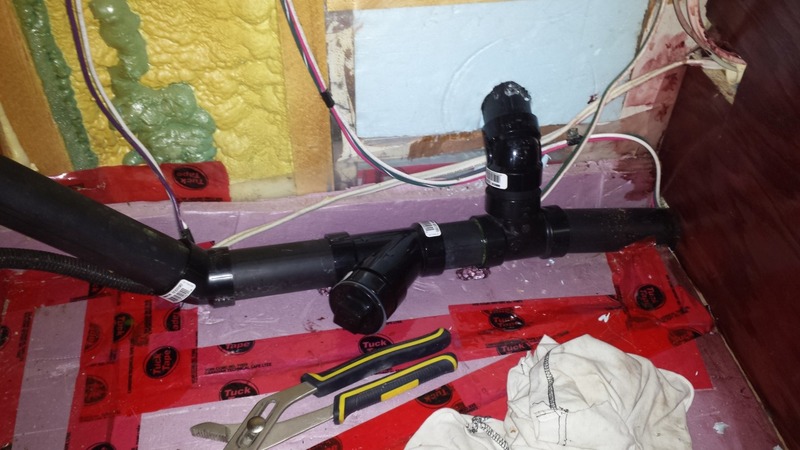 Here is a picture of the plumbing for the drain, immediately connected to the bottom of the sink. I bought a P-trap that included the clean-out, just to make our lives easier if anything needed some maintenance later on. Frankly, I don’t know why they call it a P-trap. A U-bend or an S-trap would be better. 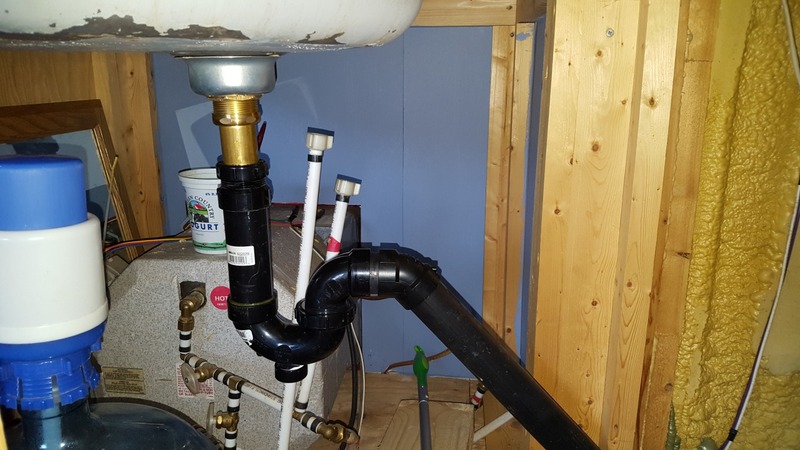 I like S-trap actually because you could make it stand for stink-trap, as the whole point of that is to keep some water in the pipe to prevent smells from the sewer or septic from entering your home. Anyway, that pipe that you see traveling downwards at a 45 degree angle joins up with all of this stuff at the bottom. I added a clean-out plug, for future maintenance, though it was a bit overkill. There is another one on just the other side of the wall on the right. The part with the T and the pipe heading out the wall through the blue insulation is the new plumbing vent I put in. The old one had been in the wall inside the small room where the toilet had been, but we removed all of that, so I needed to put the vent back in somewhere. This was a pretty convenient spot, right next to the wall. I just put a 45 degree connector on the T-junction and ran the pipe out the wall, upwards at an angle. There is another 45 just outside the wall and the pipe then runs straight up the wall of the trailer. After it was all glued together and all of the threaded bits had their sealing tape applied, it was time to try it out. Yay! No leaks. Now we don’t need to go outside to dump our dish water. 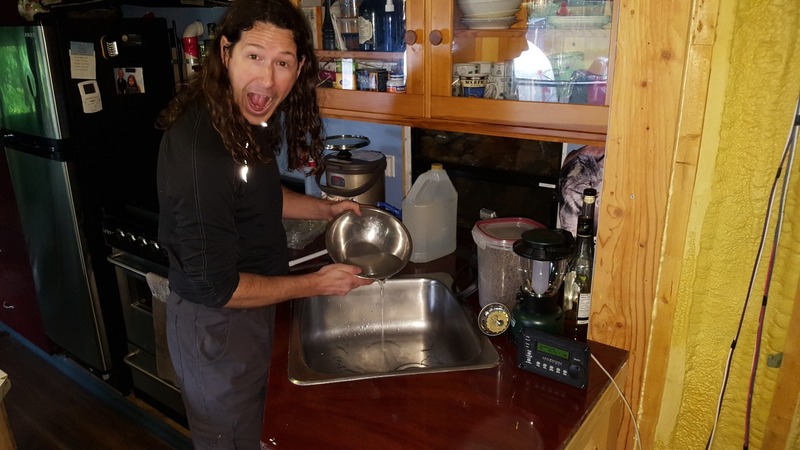 In fact, we might even be able to do the dishes in the sink. Woah! Not sure we’re ready for that kind of excitement. It’s been a good two years since we could do our own dishes in a sink. On a side note, we discovered something interesting about ABS glue and rigid insulation: the former will melt and dissolve the latter. Here you can see the hole underneath the pipe where the glue squished out and dropped onto the insulation. Something to be aware of if you’re ever gluing ABS pipe near rigid foam insulation. Despite the small flaws (and scratches… grrr) in the counter-top, this project turned out pretty well. Now if only we can complete the next project in a more timely fashion. So I had left off previously talking about the new counter-top we were working on for the trailer. I can’t say that it is all complete, but we have made some progress. 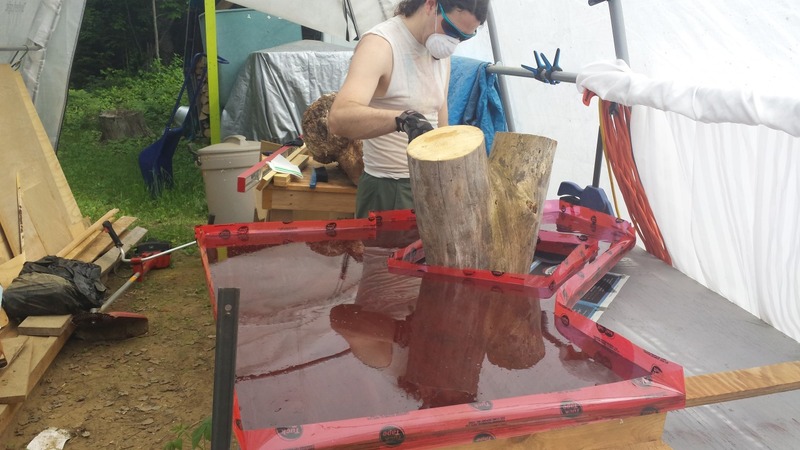 We decided to put an epoxy finish over the wood to give it a nice shiny, protective coating. This has turned out to be a little tricky. I am, however, getting ahead of myself. We started off with the prep work. 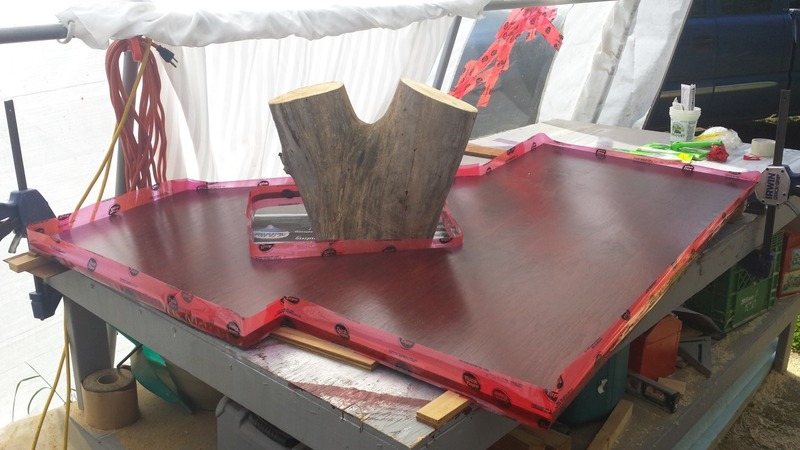 I took the counter out to our truck shelter which is acting as our work shop. Out there, Kat applied the stain and varnish to it. Once that was done, I propped it up to it was all as level as I could get it. I taped all of the edges to prevent spill-over and I also prepared a sheet to cover it after we finished the pour. If you’re wondering what the big log in the middle is for, that’s to hold up the cover sheet so it doesn’t touch the counter. So, let the pouring begin! We learned quite a few things doing this. 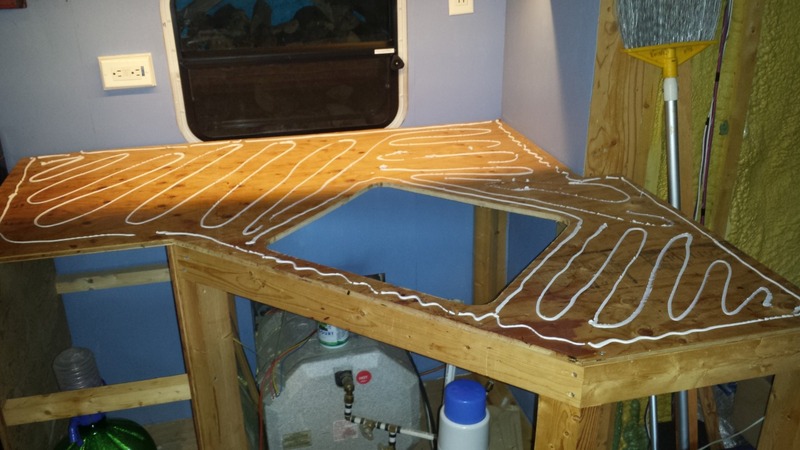 First, epoxy likes it to be warm. The warmer, the quicker it will cure. Secondly, humidity is bad. 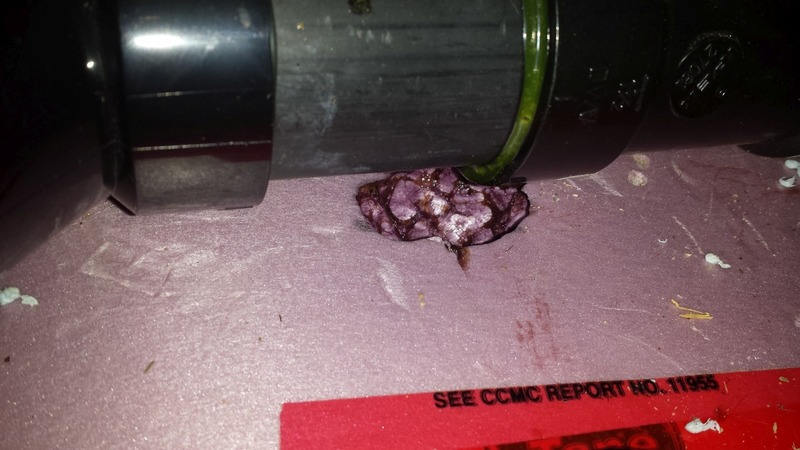 This will encourage bubbles in your epoxy and that’s not a good thing. Kat and I did this together because the epoxy starts to setup pretty quickly after you mix it. We managed to complete the pouring in short order. Fortunately, the counter-top isn’t that big. Once the pour was completed, I spent some time trying to get rid of some of the bubbles, but that didn’t go so well. According to the instructions, gently exhaling on them should make them burst as it supposedly reacts with the CO2 from your breath. Well, I did a lot of blowing and the bubbles didn’t pop at all. I also couldn’t spend forever working on this because it was starting to set, and also bugs kept falling in it. We did fish some big ones out and eventually I just covered it. 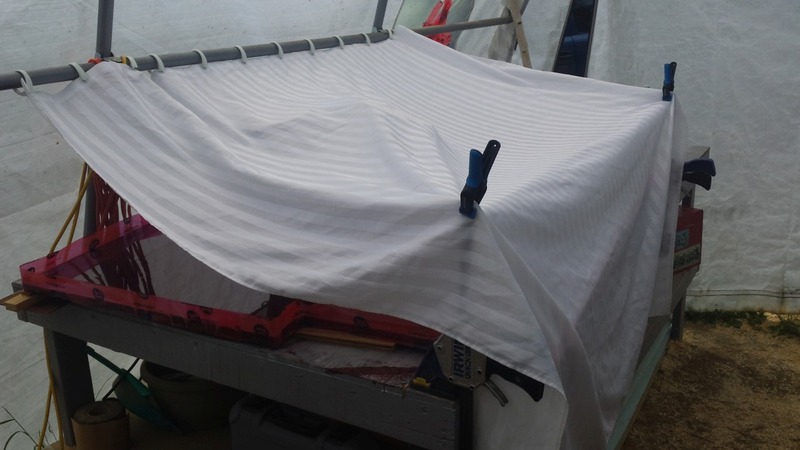 I used an old shower curtain for the cover, which worked really well. After that we let it sit for a long time, over a week. When we finally went in to look at it, it was all nice and shiny, but there were a few bugs sticking out of it and lots of bubbles. Also, the tape didn’t work quite as well as we had hoped and there were a lot of drips down the sides that we had to shave off. Here you can see Kat in her bug hat removing the tape. I took some time and dug out the bugs I could find, as well as many of the bubbles. Then I did a filler coat on top of that. It has since dried, but I plan to do one more final thin coat as that last one came out a bit rough. I did some searching online and found one website that said the most ideal setup for doing epoxy is in a vacuum. Not having a vacuum chamber readily available, we went with what we had. Hopefully, after this third coat, it will look nice. I’ll let you know how it goes after we get that done.